Fishing for catfish at Phoenix and Tucson Urban Fishing Program waters is expected to be good to excellent once the fall stocking program kicks off the week of Sept. 16-21 (see article below). Lakes will be stocked at rates of 38-85 catfish per acre every two weeks through early November. Catfish bite well on worms, stink baits, shrimp or hot dogs fished on the bottom. Use size 4-6 hooks and 6-8 pound test line. Mornings and evenings are the best times as catfish prefer to feed under dim or dark conditions. In the Tucson area, extra catfish will be stocked this fall season into Kennedy and Lakeside Lakes due to the suspension of catfish stockings at Sahuarita Lake (see story below). Fishing for bluegill is fair along the shorelines in 4-8 feet of water. Try mealworms under a small, thin bobber for good sunfish action. At Green Valley Lakes (Payson) fishing for bass, bluegill and crappie is good using worms or crappie jigs. The fall kick-off date for trout stockings to resume at Green Valley is Saturday, Oct. 19. Last stocking: The last stocking in Phoenix and Tucson Urban Fishing Program waters was June 13 (catfish). The last stocking at Green Valley Lakes in Payson was May 11 (trout). Next stocking: The next stocking in Phoenix and Tucson Urban Fishing Program waters will be the week of Sept. 16-21 when fall catfish stockings resume. The next stocking at Green Valley Lakes in Payson will be Oct. 19 when fall trout stockings resume at that lake. Fish stockings, featuring channel catfish, will resume during the week of Sept. 16-21 at 18 Urban Fishing Program waters in the greater Phoenix and Tucson areas. The fall catfish stockings represent the "second half" of the spring/fall catfish delivery season that included a two-month summer "halftime" break from stockings. Nearly 7 tons of catfish will be transported by our fish contractor from Arkansas in specially designed hauling trucks. 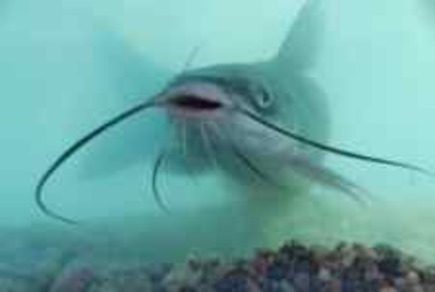 The farm-raised catfish have had a good summer growing season and most fish should be close to two pounds. Game and Fish biologists will accompany each lake delivery to ensure that all stocking operations run smoothly and successfully, and that all fish pass our high inspection standards for excellent condition and health. All lakes were recently checked for compliance with our water quality stocking guidelines and all lakes passed inspection. The fall catfish stocking season includes a total of four stockings at two-week intervals through early November. Stockings will occur on random days during the designated stocking week (Mondays through Saturday). This alternating week schedule will only change if conditions at an individual lake are unsuitable for stocking (for example high pH levels, or low oxygen). Best baits for catfish are worms, stink/dough bait, shrimp or hot dogs. Catfish daily bag limits are 4 fish at the Urban Lakes or 2 fish at the Urban Ponds. Sahuarita Lake will be undergoing a remediation project to repair lake walls this fall. Water levels have been lowered to evaluate conditions and prepare for construction work that is anticipated to begin in October. Sahuarita Lake Park continues to remain open for public use. Fishing continues to be allowed from the shoreline outside the vertical lake wall. Because angler access to the water's edge is very difficult due to lowered lake levels, and construction is forthcoming, the Town of Sahuarita and the Arizona Game and Fish Department have agreed to suspend urban catfish stockings at Sahuarita Lake this fall season (Sept. 15 to Nov. 10). For more information on the project go to: http://sahuaritaaz.gov/. 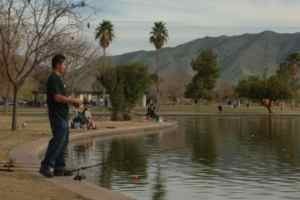 This fall, Sahuarita urban anglers are encouraged to fish nearby Lakeside Lake or Kennedy Lake in Tucson, where extra catfish will be added to the normal lake stockings.